Sorting changes the order in which your movies are displayed. You can sort your movies in various ways. The most basic way to do this is by clicking a column header, but you can also use the sort button and pick a field to sort on. This is the easiest way to change the order of your movies. While in list view, you can click a column header to immediately sort your movies on that field. Click it again to reverse the sort order. 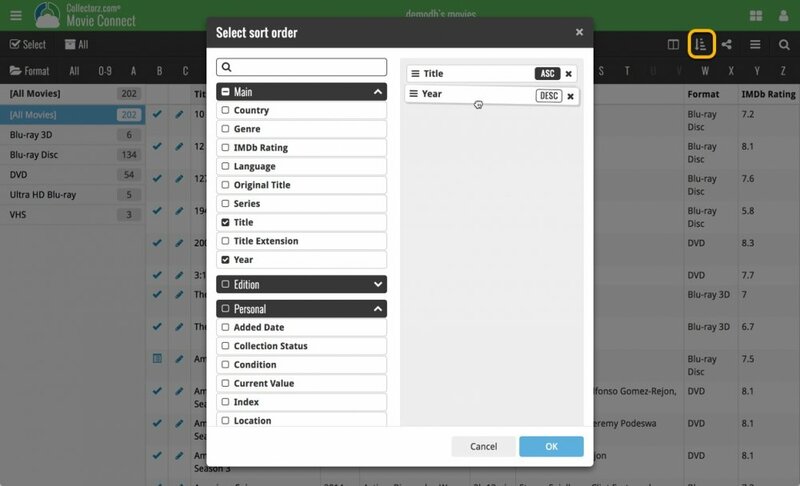 *Say you wish to sort your movies on Year first, and then on Title, you can checkbox a second field (or even more) in the “Select sort order” screen.